President Anthony Carmona greets Rudy “Twoleft” Smith at the Office of the President on February 20. 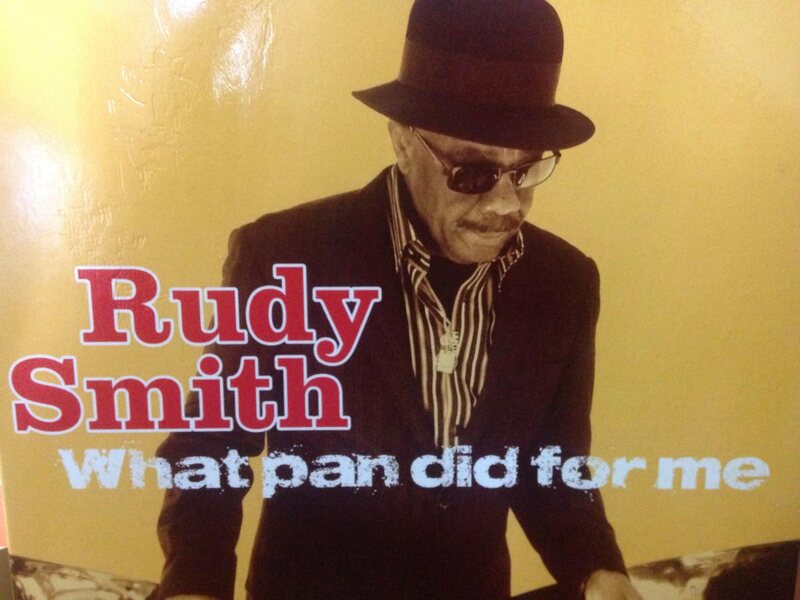 RUDY “Twoleft” Smith is an ambassador for steelpan in Denmark, where he lives in Copenhagen, and throughout Europe. However, his heart remains in his Trinidad homeland as he returns every Panorama to arrange music for Birdsong Steel Orchestra. He has done so for the past 11 years. 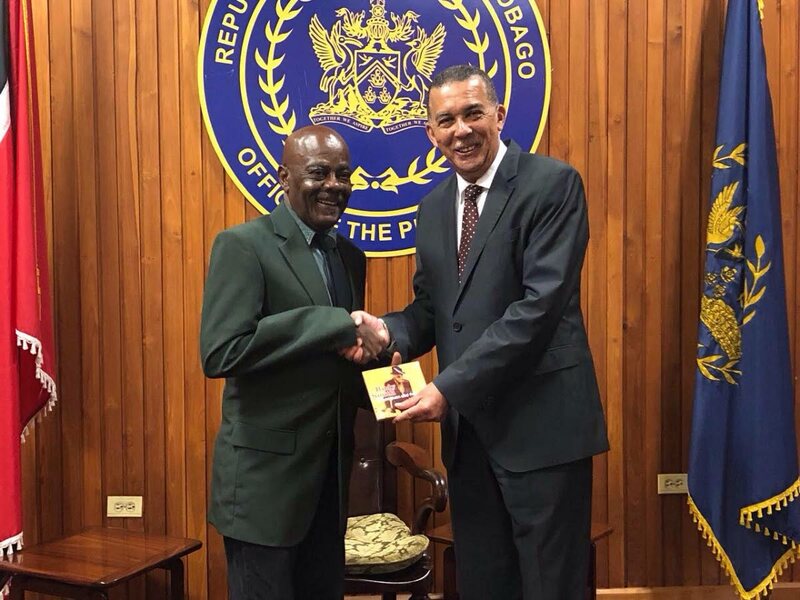 On his last visit, this son of Woodbrook received an invitation from President Anthony Carmona to visit him at the Office of the President on February 20. Carmona learned Smith was home from a mutual friend Peter De Gourville, director IT and Cloud Research and Development at Ericsson Ltd. Smith’s reputation as the quintessential pan had reached the as far as Stockholm, Sweden, the headquarters of Ericsson. As part of his thrust to recognise and appreciate distinguished cultural sons and daughters at home and abroad, Carmona would often invite such patriots to the Office of the President. This was the case with Smith, who Carmona spoke at length with, recognising his dedication to promoting the national instrument internationally. “Quite often people talk about what they did for pan, its development and growth but not what pan did for them,” Smith is quoted as saying once. The renowned arranger gave expression to this belief in his album What Pan Did for Me, a tribute to the sustainable life, growth and opportunities pan has afforded him and his family throughout his artistic career. In 1952, at the tender age of nine, Smith played with Steel Band Merrymakers for the first time on the road. This band originated from the Red Army Steel Band of Sackville Street, Port of Spain. He later travelled with Merrymakers to Suriname, Martinique and Barbados to perform at concerts and functions. On the December 8, 1962, Smith left his homeland for a six-month contract with Merrymakers in Europe. The contingent of ten comprised eight pan players, Alfred “Valger” Cooper, Alfred “Sack” Mayers, Cecil “Lord” Yuille, Ansel “Baboolal” Joseph, Buntin “Danny” Grant, George “Cuma” Anderson, Herbert George, singer Daphne Shepard, limbo dancer Nolan Jacob and Smith. The extended tour took them to many countries in Europe including Germany and Sweden. Merrymakers was phenomenal in their outreach and vision spreading the steelpan music to Copenhagen, Malmo, Milan, France, Japan, Rome and Tunisia. Europe had its influence and exposed Smith to jazz music and he eventually became a master pan and calypso jazz musician. Smith holds the distinction of being among the musicians invited to play at the gala ceremony in Switzerland (a fact unknown to most Trinbagonians and West Indians) when Sir Derek Walcott was bestowed the Nobel Peace Prize in Literature in 1992. The untold story Smith is a testament of the viability of the steelpan and the arts as a career. There is now greater international reach and significant appreciation of our national instrument due to persons like Smith. At the age of 75, he continues to spread the gospel of our national instrument throughout the cities of Europe. Reply to "Rudy T, ambassador for pan"